Golf empowers. That’s the main message of this book. Much of the action takes place in Rockford, Illinois, a community that has been one of America’s most supportive golf towns for generations. While Rockford embodies fundamental practices that can lead to golf flourishing anywhere, it also serves as a case study in how to keep the game healthy and strong. An Old Caddie is the first serious attempt to dig beneath the surface of Rockford’s golf story. It is a memoir from my perspective, not a comprehensive history, and while my experiences and conclusions are shared by many who have contributed to the game in town, much is left unsaid here and should be the subject of future stories written by others. My focus runs from the late 1940s through the early sixties and then picks up again in 1989. That’s when I meet Earl Woods and his thirteen-year-old son. A life-long Rockford buddy of mine, Bill Stark, had by then become a regular playing partner of the Woodses and introduced me to them. As guests of Earl, Bill and I attended the 1998 Masters where Tiger was defending champion. During that April return to a place we experienced decades earlier, we discussed the benefits of bringing Tiger to our old hometown. Rockford is not only aware of the threats that can diminish the impact of the game, it is committed to addressing them. Much of my story concentrates on Rockford’s values as they relate to golf. When I was a kid, the community was not a welcoming place for racial minorities who wanted to play the game. Now it is. This transformation became a focal point of my thinking in the book’s early development, and caused me to look back and anew at my past half-century of golf, and America’s. The perspective I gained as a young caddie in the 1950s turns out to be powerful in retrospect. Caddying at one time was a step on the ladder toward upward social and economic mobility for countless youngsters in Rockford and beyond. Caddies see the empowerment of golf close up. They also witness sportsmanship, etiquette, good swing habits, bad swing habits, temper tantrums, four-letter words, and a cross section of other behaviors that in the final analysis offer a net benefit. The disappearance of caddies from all but a few elite private clubs has diminished the opportunities of contemporary young aspiring golfers. However, the disappearance of caddying is not the only challenge for those of us who want folks of all ages to taste a bit of the potential empowerment of golf. And here’s where my old hometown impresses me the most: Rockford is not only aware of the threats that can diminish the impact of the game, it is committed to addressing them. As a callow young fellow generations ago, I thought that Rockford had to be one of the best communities when it comes to golf. I still do. Maybe the very best. Having grown up in Northern Illinois I can testify to the wonderful way Tom Warren has captured the essence of Rockford and its commitment to presenting affordable good quality golf to all the people of the area. I have lived the past 39 years in Atlanta, Georgia and have attended at least one day of the activities at the Masters Tournament every year except one, and I praise Mr. Warren on his accuracy in reporting the thrill of being in Augusta tournament week. Tom Warren has done a masterful job of weaving the story of Rockford golf. It is informative, educational, yet entertaining as he combines fact with personal experiences. It is a must read for any golf enthusiast. It’s wonderful what Tom has done. He has an incredibly rich history and background and knowledge of the community and golf. Some of Tom’s accounts were so hilarious that I laughed till I had tears in my eyes. His days of caddying brought back memories of my being a caddie and how it opened up new doors for me. His observations about kids and adults playing the game are as true today as ever regarding the joys and disappointments of this great game. Tom Warren has written a warm, reflective study of golf that honors the game and the community that has allowed us to participate. This book can be extremely helpful within Rockford and as a way to alert other people to what we are doing here. ~ Doug ScottFormer Rockford Mayor; Director of the Illinois Environmental Protection Agency. Thanks for writing a memoir that is so positive an “chock full” of our Midwestern values. What a joy…reading about my dad before I really knew him… Thank you for writing this book and acknowledging my father’s influence on you. Many times I had to stop reading because of the tears. Headline: Book Launch is Dead Solid Perfect. 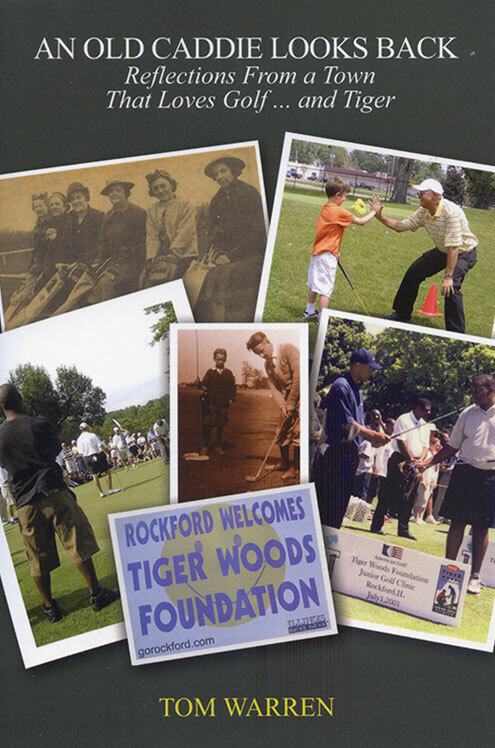 “Just like his book, [it] was a celebration of Rockford golf “(September 13, 2007). I found the Augusta stories to be very interesting and well written. I remember sleeping in my car too. I was right there with you on your young and carefree trip out west [to Pebble Beach and Desert Inn] especially when you were told to get out of the lake. Tom Warren is more than a student of the game, he’s a scholar who seems to have absorbed every detail of golf’s storied past, and who recounts with absolute glee so many of those fabled moments that defined the greatness of the game’s elite. But his point of view is far from academic, as he takes us through the story of his own evolution as a dedicated amateur golfer. In many ways, Tom Warren speaks for all of us who, early on, became mesmerized by and addicted to the joys of this most complex and yet Zen-like of sports. …Just as there’s more to the game than merely hitting a little white ball around a pasture, there’s more to this book than golf. What we get here is not simply the view from the practice green and the driving range and the tee-box; we get a portrait of America itself ranging from the time when everybody liked Ike to the time when everybody likes Tiger.